Flannery O'Connor Summer Reading Club Week 3: "The River"
Little Harry/Bevel, the main character of "The River," has spent his whole life in a world where he doesn't he doesn't matter. He lives, in fact, in a world where nothing matters. Everything is a joke in his parents' world. His father jokingly calls him "old man," and he is compared to "an old sheep waiting to be let out," but his parents are perpetually adolescent, refusing to take any responsibility for him. From the boy's first encounter with Mrs. Connin, he starts his exodus out of his parents' world and into another. He gives himself a new name, affiliating himself with the preacher Bevel Summers (and it is worth noting that the narrator never calls the boy anything but Bevel thereafter). He doesn't know what ails him, but something in him resonates when he hears that Mrs. Connin is taking him to hear a faith healer preach. "Will he heal me?" Bevel asked. "What you got?" "I'm hungry," he decided finally. He's talking about a physical hunger, but this is a story about a spiritual hunger that little Bevel doesn't have any language for. His visit to another world stirs up in him longings he didn't know he had and reveals to him things he had never had any way of knowing. He had found out already this morning that he had been made by a carpenter named Jesus Christ. Before he had thought it had been a doctor named Sladewall, a fat man with a yellow mustache who gave him shots and thought his name was Herbert, but this must have been a joke. They joked a lot where he lived. If he had thought about it before, he would have thought Jesus Christ was a word like "oh" or "damn" or "God," or maybe somebody who had cheated them out of something sometime. O'Connor was a gifted ironist. And yet in this story she strikes a blow against a view of the world that is finally ironic. She admires the earnestness of those good country people, Mrs. Connin and Bevel Summers. Little Bevel's family represent a theme that we will see in many of the stories that we will read throughout the rest of the summer. They represent an urbanity and sophistication that is never adequate to support the weight of truth. Simple country folk--even ignorant country folk--always come closer to the mark than the sophisticated. That's not to say that the ignorant and unsophisticated are always right in O'Connor's fiction. They are wrong often enough. I merely suggest that their track record is quite a bit better than that of the educated and citified. "If I Baptize you," the preacher said, "you'll be able to go to the Kingdom of Christ. You'll be washed in the river of suffering, son, and you'll go by the deep river of life. Do you want that?" "Yes," the child said, and thought, I won't go back to the apartment then, I'll go under the river. "You won't be the same again," the preacher said. "You'll count." Then he turned his face to the people and began to preach and Bevel looked over his shoulder at the pieces of the white sun scattered in the river. 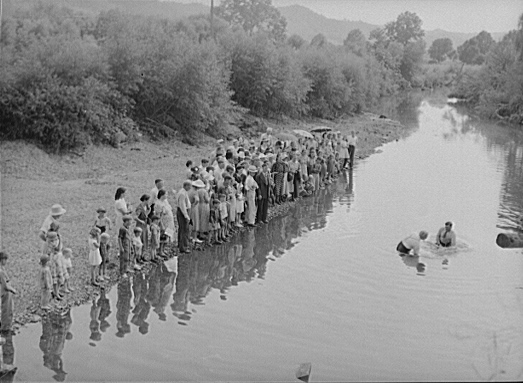 Suddenly the preacher said, "All right, I'm going to Baptize you now," and without more warning, he tightened his hold and swung him upside down and plunged his head into the water. He held him under while he said the words of Baptism and then he jerked him up again and looked sternly at the gasping child. Bevel's eyes were dark and dilated. "You count now," the preacher said. "You didn't even count before." It's a scary scene, with the boy being held under water and coming up gasping. But I don't think O'Connor meant any of this ironically. The boy does count now in a way that he didn't count--indeed, still doesn't count--at the apartment. The Ashfields take offense at the fact that Mrs. Connin let the boy be baptized and had the preacher pray for Mrs. Ashfield, but they don't offer any alternative meaning for him to grasp onto. The next morning, the boy is as abandoned as ever when he wakes up at home. It is no surprise that he returns to the river in search of the kingdom of Christ--the kingdom where he counts. What do you make of the boy's determination "not to fool with preachers any more but to Baptize himself"? Why is Mrs. Connin twice described as looking like a skeleton? What do we do with those hogs? It's clear enough that the shoats in the pen are connected to the hogs that received the evil spirits that Jesus cast out of the man...but what are we to make of it? And is there any significance to the fact that Mrs. Connin got the story wrong? Jesus didn't cast pigs out of the man; he cast spirits out and into the pigs. I just take it as evidence that Mrs. Connin is ignorant and confused; but does that in any way diminish her authority as a guide for the little boy? I didn't even touch on Mr. Paradise, who is obviously an extremely important figure. What's he doing in the story? Why is is name Paradise? Some of you may completely disagree with my reading and see some irony or something sinister in Bevel Summers. If so, let's hear from you.